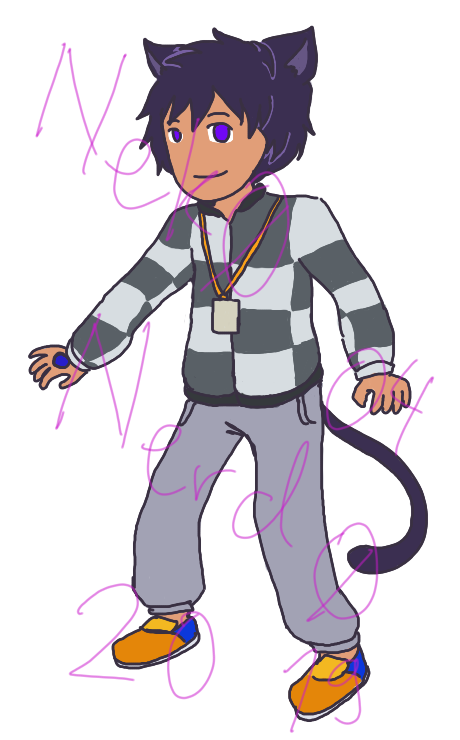 A male neko who has access to almost everything. He has a keycard (which serves as an ID card as well), he has an actual key, he has his hand stamped, he has a ticket attached to his keycard, he just plain has access. He is quite cynical and he started out as an ill-intentioned greedy opportunist. But now he learns to be a samaritan in the background where he doesn't make too much noise. Basically he used to be an internet personality before he decides to be incognito. All while he does this, he has his own private community where he catches out not so nice people online. But he is only able to do this because he USED to be a not-so-nice person on the internet himself. This would be a nice reflection for how we are today on the year 2019. He is specifically made to represent how the online world is today, on 2019. I want to make sure that he is as contemporary as the hidden rules of entertainment allow him to be. It's about time we have characters like him. I invite you to make your own contemporary fictional character. Good luck and have fun.